[Via Satellite 03-19-2014] SES has expanded its reach to more than 291 million TV homes around the world, with 151 million located in Europe. According to SES’ “2014 Satellite Monitor” report, of the 291 million TV homes, 106 million are satellite homes, more than 153 million are cable homes, and more than 32 million are Internet protocol TV (IPTV) homes. Europe remains a strong market for SES, with 75 percent of satellite homes serviced by the company. However, while SES has seen growth in this region, the majority of its total growth seen in 2013 came from international markets. In 2013, SES increased its presence in Europe by 5 percent, compared to 7 percent in Asia Pacific and 18 percent in India. Latin America grew by also 5 percent, but new upcoming satellite capacity presents an opportunity for expansion. SES has already ordered two of four planned satellites. The SES 10 satellite, intended to replace AMC3 and AMC4 in Latin America, will offer 50 Ku-band transponders. This is an increase of 22 compared to its predecessors. Slated for launch onboard a SpaceX Falcon 9 in Q2 of 2016, the satellite is to be located at 67 degrees west, an orbital slot where Telefónica Digital is the largest customer. SES worked with the Andean Community to identify the 67 degrees west orbital slot, and some of SES 10’s capacity will be allocated for governmental purposes. The Colombian state-owned operator Señal Colombia currently broadcasts from this location. Still, the increase in transponders will allow SES room for new customers. Overall, SES continues to show growth year over year. The company’s direct reach to satellite homes grew from 99 million in 2012 to 106 million in 2013. SES also had significant relative growth of its direct reach in other emerging markets. Asia-Pacific grew by 21 percent, and Africa, the Middle East and India grew by 18 percent. 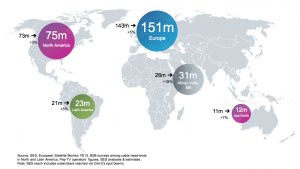 In Europe SES satellites cover 95 percent of cable and IPTC homes, as well as 81 percent of HD homes. Germany continues to stand as SES’ largest single DTH market on the continent. Simon’s research report pointed out that O3b, whose fleet is being collaboratively built by SES, Google, Liberty Global and various financial investors, stands as another source of growth for SES. The maturation of the Ultra-HD market should also influence capacity deals, as an NPD report projects the Ultra-HD penetration will exceed 8 percent by 2017.